As a dental practice, we naturally believe that a positive experience begins with being greeted by a friendly, smiling staff member. We are glad that you chose us to be your dental care provider, and want to make you feel completely relaxed and comfortable. We will have you complete a medical history form, using an iPad. One of our nurses will check your ID. (It’s an accreditation requirement). 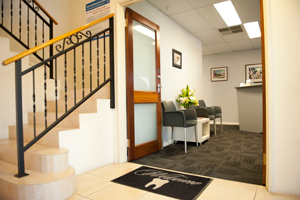 One of our dentists will greet you and discuss treatments. We will perform an oral examination and take x-rays so we can provide a diagnosis. We are also happy to provide an extended consultation if you have had past fears about seeing a dentist. If you have current x-rays that were taken elsewhere, you can bring those to your appointment. Please also bring with you a list of any medications that you are on as well as your health fund card if you have one. Please note that payment is due on the day of treatment. Patients coming in for preventative care or a cleaning appointment will be given a complimentary oral hygiene pack. Upon completion of treatment, we will send out a survey to see how you enjoyed your experience as well as a treatment completion pack. You can also sign up to receive our newsletter. Please allow approximately 45 minutes for your first visit. Note: a person’s first visit may be for an emergency tooth repair or procedure. For dental emergency information, click here. At your next visit, you will receive a scale and clean. Second or third visits may include everything from fillings and crown preparations to teeth whitening assessments, depending on your needs. If your treatment plan is particularly large, we like to try and break it down for you, so you’re not feeling burdened financially. We also will offer a complimentary treatment plan discussion to ensure that you’ve fully understood the treatment plan. If you wish to come back and have another discussion with one of the dentists, you can do that too. We understand sometimes it’s necessary to cancel an appointment. Please read our Cancellation Policy. If you have any questions about what to expect at your first appointment with us, please feel free to contact us.